Property Frontier brings your whole property portfolio together in one easy to use, fully integrated system. Easy to use: No courses or training manuals. Buy right: Compare different potential properties. Project performance: Determine growth, cash flow and profits. Keep track: Get auto reminders for rent, expiring leases and more. Property Frontier makes it easy to see a complete picture of your portfolio. Everything together, including income, expenses, cash flow, profits, capital value, growth, bonds, rental info and specs. 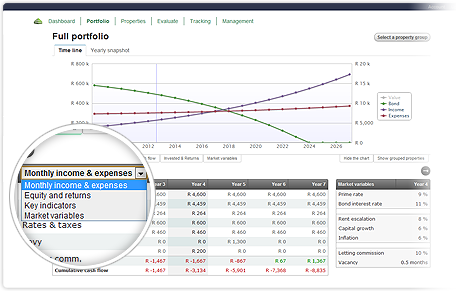 Full portfolio view: View your properties individually or see your total portfolio combined. Group similar properties: View properties by type, owner, area or any other personal preference. Quick find: Find all your property specs and rental details at the click of a button. Property Frontier shows you how your properties are performing by comparing cash flow ratio's, average growth, profits, return on investment, and more. 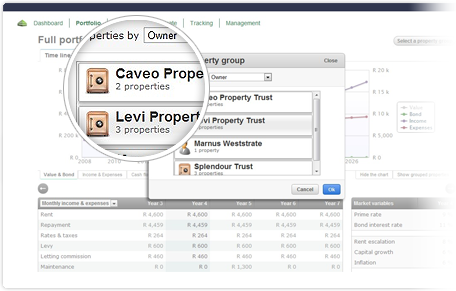 Property tracking: See key indicators to keep track of the performance of all your properties. Performance comparison: Determine your best properties by comparing them side-by-side. Property ranking: Identify best performing property types, classes and investment locations. Property Frontier let's you see where you're portfolio is headed. Effortlessly project future performance based on historic data, anticipated events and market changes. bond value and capital returns. Account for future market variables: Set market variables for your total portfolio or individual properties at any projected future year. 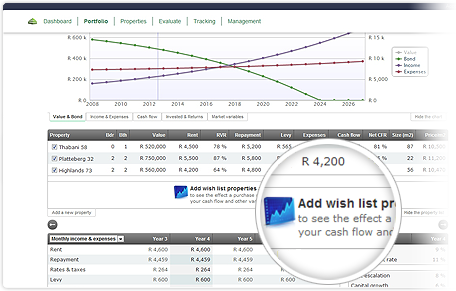 Property Frontier enables you to determine your exact future cash flow. This helps in being prepared for the unexpected and to know when the time is right to buy your next property. Property affordability: Determine the effect of new properties on your total portfolio's cash flow. 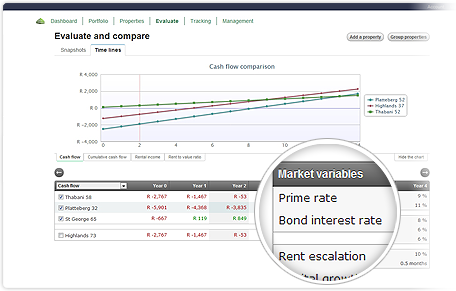 Cash flow sensitivity: See the effect of changes in interest rates, vacancies and routine maintenance on your portfolio. Cash flow projections: Adjust for future inflation, rental increases and routine maintenance. break-even, purchase price, and property type and size. Buy and sell right: Compare the future performance of new and existing properties to know which properties to buy and which to sell. 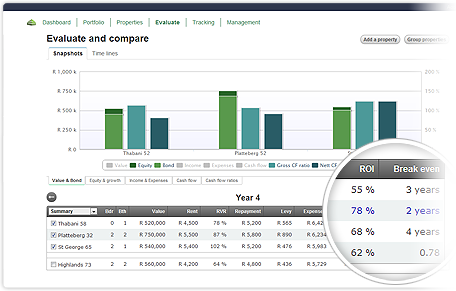 Compare key property stats: Analyze the cash flows and returns of different properties as well as past and future performance. View best, normal and worst case figures: Compare and calculate scenarios based on different future market estimates. Property frontier let's you track your property's income and expenses easily so you can be on time with rental increases and lease renewals. Track your cash flow: Confirm or modify each month's transactions as they occur and easily pick up missing income or increased costs. Value and bond changes: Keep track of your property's equity by recording valuations and bond changes. Automatic reminders: Get automatic reminders for rent due, expiring leases and cash flow tracking. Never loose your data: Your portfolio is securely stored online. Quick and Easy to use: No training manuals required. Safe and secure: 128-bit SSL encryption, the same security banks use for internet banking. No downloads or installation: Regular online updates with new features and improvements. Get the first 90 days for free: Cancel anytime and get started with a low monthly fee. Great time saver: Property Frontier makes property investing quick and easy. Limit your exposure: Easily view the effect of market changes on your portfolio. Up-to-date market variables: Current prime rate and inflation kept up to date automatically. 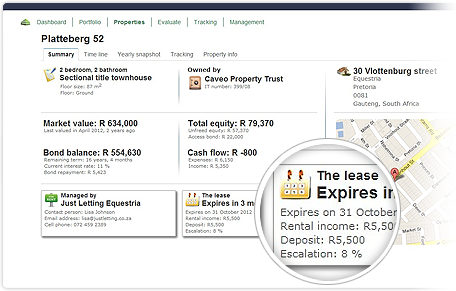 Reduce tenant vacancies: Proactively keep track of expiring leases. Know when to buy: Plan your next property purchase effectively. Equity opportunities: See your refinancing potential as well as the cash flow effects. Investment goals: View your current portfolio performance to see if you are on track. Accessible from anywhere: Always online, you just need the Internet. Intuitive to use: You will pick it up in minutes. property investors recommend Property Frontier. of customers feel that Property Frontier will help them become wealthier. by Jason Lee, best selling author on property investing with more than 50,000 copies sold. You will be a Property Frontier pro in minutes! It takes less than 5 minutes to add a property. View performance, buy right and keep track!